For little children waiting for the special day can seem like an eternity. It is always helpful to have something concrete that they can look at to give them a sense of time. 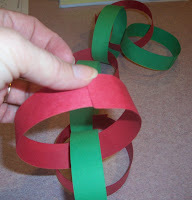 One item to make is the oh-so-popular Christmas chain. 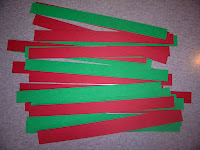 This is made with red and green strips of paper glued to make a chain. 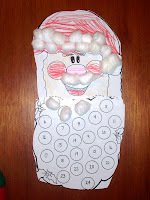 Glue together 24 rings then have the children remove one ring a day until they get to Christmas. I have also seen this done with special deeds written on each ring so when the ring is removed something special is done. For example, one ring might say, "Send a Christmas card to your best friend," something along those lines. I used a paper cutter to cut the paper into 12 x 1 strips, you can also do 9 x 1--it depends on the size you are looking for. Each child gets 24 strips of paper. Glue gets put on one end, then glued in a circular shape. 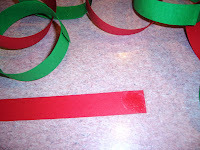 For all subsequent rings I had the children put the glue on the end first, put the strip inside the previous ring, then glue together in the circle. These look great just hanging around the house for decoration also. 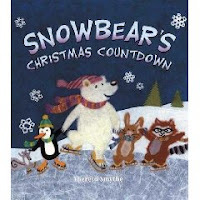 I read the book called "Snowbear's Christmas Countdown," by Theresa Smythe. This is a great story about a bear getting ready for Christmas. It counts from day one to the actual Christmas day. Bear does something special each day to get ready for the wonderful holiday. I thought the illustrations were cute too.